We have been soooooo busy lately. People, including myself, say that phrase a lot, I think. You hear it everywhere. "We've been so busy." "Things have been crazy around our house!" "We don't have a moment free!" There are many ways to say it, but.....most moms I know would agree: we have tons and tons on our plates. In many cases, we have way too much going on. Thursday: our only "free" night of the week. Mostly, we have been using this as our 'get-caught-up-on-yardwork/gardening/miscellaneous tasks-around-the-house' night. So, even though we have "nothing" officially going on, Thursday is still a very busy day at our house! Friday: Why, date night, of course! Nothing trumps date night, I don't care what task needs to get done or what we have been asked to do! It can wait. Shane and I get to have our special night away all to ourselves, and the boys get their special time with Grandma MJ. Every week, almost without fail. Saturdays: Ah, finally. Family day. Today was a great day. We threw out many suggestions at breakfast of what we could do for the day, but in the end it was decided that we would stay put at the house and enjoy each other here. Turns out, it was a great suggestion. 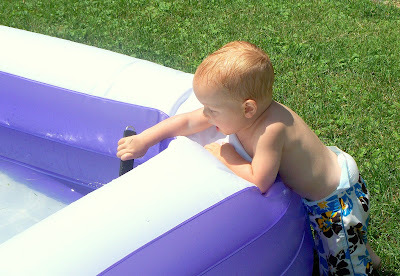 We headed out to the backyard to the boys' current favorite activity: The POOL. Not the public pool, or even a friend's pool, but our very own pool. 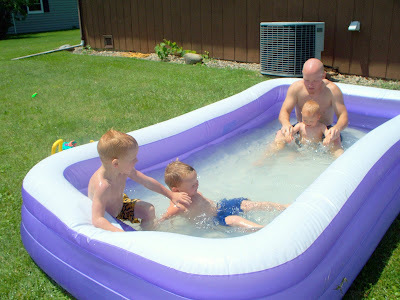 Yep, this is it--our family pool (made famous in recent days by Cameron's accident). Not huge....not much to look at....but a ton of fun can be had by all in this thing! My sweet little Ethan. 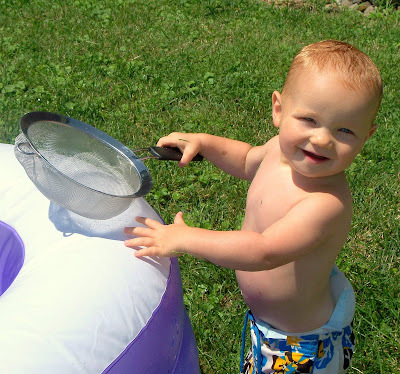 He does enjoy the pool, but only after the water sits for a couple of days and gets nice and toasty! Mostly, he just likes to stay and cuddle with Mommy! 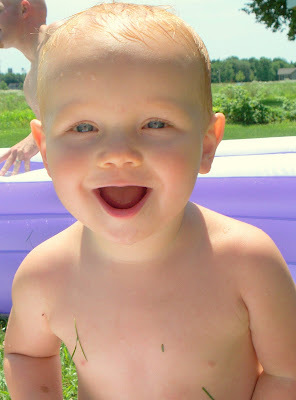 He got brave and tried the slip and slide today--hence, the grass all over his belly! Now, this was a funny moment. The boys had started the day out on the slip and slide, and had played successfully (minus one near-concussion-style incident with Colin) for quite awhile. 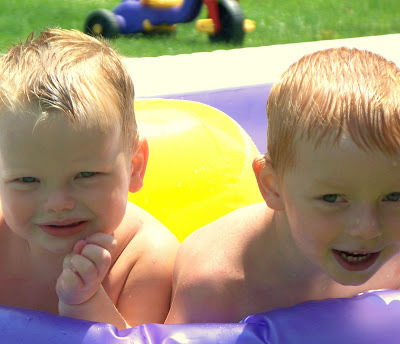 We turned the hose to the slip and slide off, however, once they started playing in the pool. 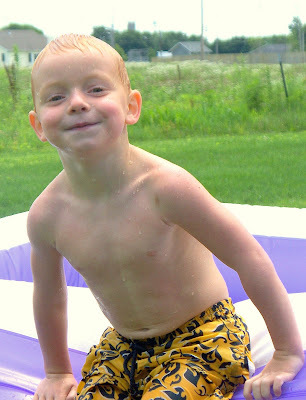 About an hour later, Cameron decided he wanted to go down 'just one more time', but the slide had partially dried up. Cameron was going nowhere until Colin came to the rescue and pushed him all the way down to the pool end! I don't know what was funnier....the sight of Colin pushing Cameron, or the fact that Colin grunted most of the way down to the end! "See! I can do this just like Mommy does!" 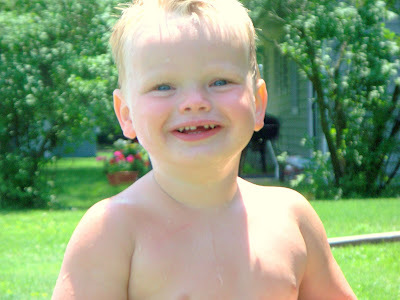 Finally, we got Ethan into the water....and, surprise, surprise, he loved it! Splashin' like a crazy fool! "Seriously, Mom....you need to get me in here more often." "I know you won't get mad at me 'cause I am just so cute, Mom!" 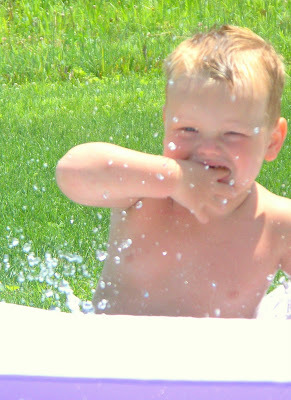 Cameron, my serial splasher.....on the receiving end of the splashes for once! My little troublemakers....I can just see them cooking something up while hiding behind those innocent little smiles! ...and he is more unique than ever with his new smile! We came in, napped, and had some yummy sausage calzones for dinner and mini-cherry crescents for dessert. It was so yummy (and easy) that I think I may try to post the recipe in the next few days! (If you are anything like me, you're someone who would appreciate a delicious yet easy recipe! 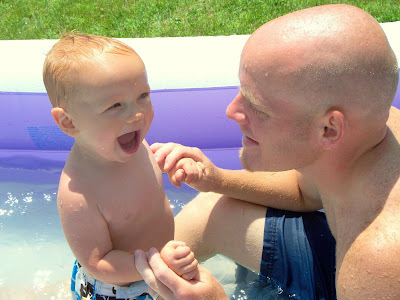 *giggle*) Daddy is in reading with the boys, and I am here blogging away about our day. No matter how busy we are as a family, days like this are so important for so many reasons. We need time to relax and de-stress....because Monday is right around the corner and the chaos starts all over again, right?! Glad you had time to relax and play today! 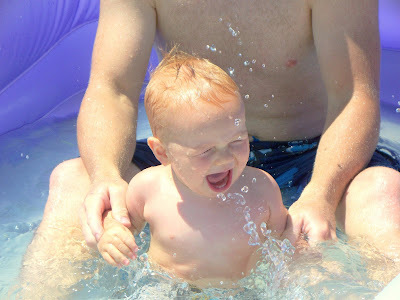 Pools are SO much fun! 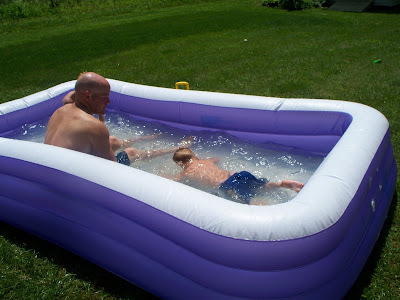 And who says you need a big pool for it to be fun for the whole family? You guys have certainly proved that's not true at all! Those pic's are so good Dev!! 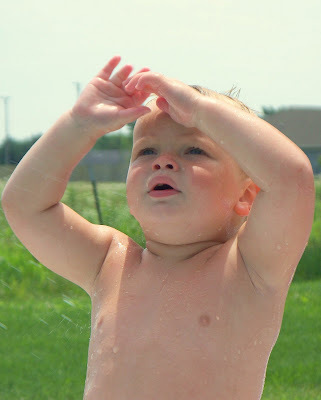 I love the one of Ethan looking out of the pool, what a doll. I have not forgotten about sending the pic's. I have been gone since Friday morning, so I will send them tomorrow. Glad to hear that you didn't lose the pic's, what a relief, huh?